Update 12th december 2011: The MAG Ireland High Visibility Survey has now closed. More than 800 of you responded. We in MAG Ireland extend our sincere thanks to everyone who took part. We’ll be publishing the results in full on the web site in due course. For those of you who missed the survey and would like to participate, we have a form at the end of this post for your comments on the subject. Unless you’ve been living under a rock in Antarctica, you’ll know by know that the RSA has a proposal on the table for the introduction of mandatory high visibility clothing for Irish motorcyclists. MAG Ireland’s position on this is simple, we say “Let the rider decide”. We ran a quick poll recently to which over a thousand of you responded. 9 out of 10 said they did not want mandatory high viz and supported the option of letting the rider decide. 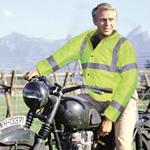 The RSA has told us that if voluntary wearing rates increase to the point where three out of four riders are wearing high visibility clothing, then there should be no need to introduce a law forcing all bikers to wear it. To establish the wearing rates, the RSA has carried out observational studies – that is standing by the side of the road and counting the number of passing bikers who are using high visibility clothing. We here in MAG Ireland understand that may of you choose to wear high viz when you feel it’s appropriate to do so – for example at night where the retro reflective bands may make it easier for another road user to determine that you’re on a bike. In order to get a better picture of the situation as it stands now, MAG Ireland is asking you to take part in our “high visibility” survey. It consists of 12 questions, and should take less than five minutes of your time. The results will help us to better understand when, where and how you use (or don’t use) high visibility clothing. Please ask you biking friends to take part, post it on your Facebook page, bike forums, mailing lists etc. We need as many Irish bikers as we can to participate. We’re aiming for several hundred responses & we’ll be publishing the results in due course on our web site. Sorry! This survey has now closed but you can submit your comments on the issue using the form below.